A green roof is, most basically, one that is covered with vegetation. Plants are grown in several inches of soil atop a waterproofing membrane. Some green roofs include drainage and irrigation systems. Green roofs are used on industrial, office, or residential buildings for their energy efficiency benefits (by insulating buildings and keeping them cool) and stormwater management. They also help mitigate the urban heat island effect, which happens when the temperature is hotter in urban areas because of the heat absorbed by the pavement. The roof is also useful when it rains: it acts like a sponge and absorbs much of the water that would typically run off and into the nearest drain or river. 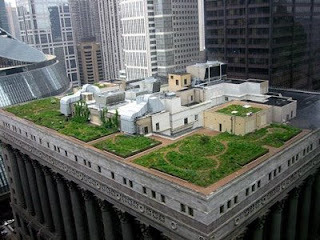 Below is an example of a green roof: Chicago City Hall.